I'm not going to lie, day one was exhausting! It was exhilarating and I think at times you find yourself just feeding off the crowd and the excitement around you, but when you get to the shuttle and you're on your way back to the car, it starts to hit you. And as long as day 1 was, day 2 was a bit longer! 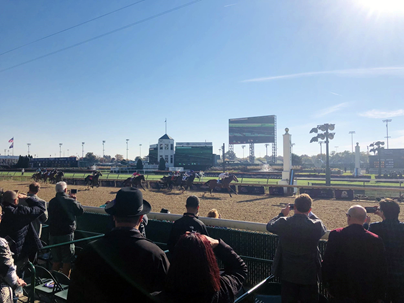 I arrived a little later on Saturday, but was still there well before the first 10:45am post time for the first undercard race. Since I already knew where everything was, how to get to the Clubhouse, etc. I took the time to pick up a few souvenirs and check out the Kentucky Derby Museum gift shop - which is a must do, especially if you're a Secretariat fan. 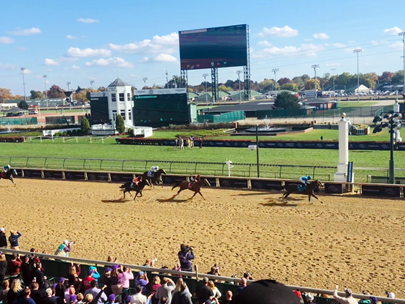 There were two undercard races Saturday. The first was an $82,000 1 1/16ths race for three year olds and up with essentially limited racing experience and wins. 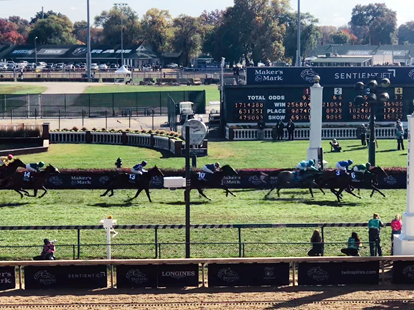 The second was The 1st Running of the Qatar Cherokee Run Stakes worth $200,000. Another famous Kentucky Derby contender was in the field - the one and only AUDIBLE. I have to admit I was pretty excited to see him and he had me stressing out for most of the race. PRINCIPE GUILHERME set the pace and held the lead for most of the race. AUDIBLE held a spot midpack for the majority of the race and as they made the turn came out wide. Coming down the stretch, he shot to the front to win by two lengths. He's been off for six months since coming out of the Kentucky Derby. 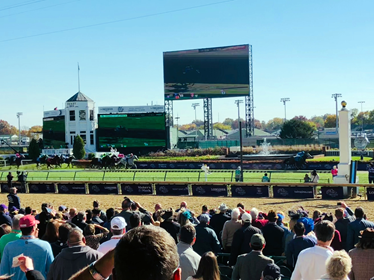 After the Cherokee Stakes, it was time for the first Breeders' Cup race of the day. At 7 furlongs, there were several nice mares and fillies in the field. All eyes were on SELCOURT, the Baffert trained MARLEY'S FREEDOM and FINLEYSLUCKYCHARM. But it was SHAMROCK ROSE who stole the show with the 25-1 upset. The Turf Sprint was a 5 1/2 furlongs featuring a field of 14 very capable turf horses. WORLD OF TROUBLE set the pace, but in the end, it was a duel between the Peter Miller trained STORMY LIBERAL and the Jason Servis trained WORLD OF TROUBLE. STORMY LIBERAL won his 4th straight race and defended his Breeders' Cup Turf Sprint title. The fifth race is where our winning ways for the day really began, in terms of our tipsheets that is. In the paddock, we noticed that something wasn't quite right with CATALINA CRUISER, as he appeared to be panting. Those suspicions were affirmed when the horse failed to perform as expected. He broke wide, slowed and then ended up finishing sixth. He wasn't the only one to not perform as expected either, FIRENZE FIRE just never seemed to have the fire needed to get to the front of the pack. Our pick for the win, however, was CITY OF LIGHT finishing strong ahead of SEEKING THE SOUL our pick for the place. This made for a nice paying cold Exacta with 22x profit. This was one of my favorite of the day. I love watching the fillies and mares and I was excited to see more Chad Brown horses in action. Over the past few months, Brown has become one of my favorite trainers and I've really been enjoying watching his horses when on the turf. The hard part about betting on a closer is the anxiety of whether or not their going to actually close! SISTERCHARLIE didn't disappoint, although she had me worried! The result was another good paying Exacta win at $37.20 and the Trifecta at $301.60. SISTERCHARLIE won by a nose over WILD ILLUSION and FOURSTAR CROOK. A RAVING BEAUTY ran a good race leading the pack and setting the pace, but she faded to third at the wire. The Sprint featured a field of nine running 6 furlongs. Watching the horses in the paddock, everyone looked good but number 9 ROY H never left the stall and left the paddock well after the rest of the field, playing catch up during the post parade. 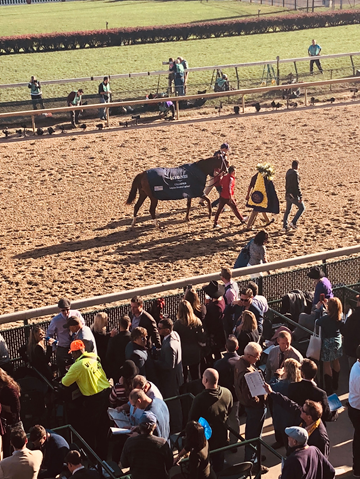 Although I'm not sure what the delay was, maybe he's naughty in the paddock or maybe there was some other issue, either way, he was unfazed and went right to work in the Sprint. This was an even better paying race for our tipsheet than the 6 race. Our tipsheet hit the top 5 horses in order! We hit the $41.20 exact, the $125.20 trifecta and the $361.00 superfecta. If you played our top 5 picks in order, you would have had a nice pay day of $66,000! PROMISES FULFILLED went straight to the front after the start. ROY H hung out in fourth. The fractions were extremely fast at 21.3 seconds. Coming off the turn, ROY H went wide, rallied and won by three lengths followed by WHITMORE and IMPERIAL HINT. I just so happened to be watching from the box next to several WHITMORE connections and they were very pleased with his race. The Mile featured a large field of 14. I really liked the way OSCAR PERFORMANCE looked in the paddock. He had schooled there the day before and looked ready to go today. Unfortunately, he just didn't perform as expected. The star of the Mile was EXPERT EYE. ANALYZE IT set the pace and EXPERT EYE was three wide around the first turn. As they entered the stretch it was battle between several horses wide including MUSTASHRY, CATAPULT and DIVISIDERO. In the end, it was EXPERT EYE, CATAPULT and ANALYZE IT. 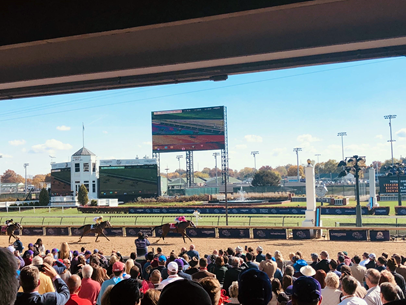 At 1 1/8 miles, the Distaff was another great filly and mare race featuring some tough competition between WONDER GADOT, ABEL TASMAN and MONOMOY GIRL. MONOMOY GIRL has had a bit of controversy this year, particular where ABEL TASMAN is involved. WONDER GADOT has been everything you want in a filly with some very big races under her belt. The Distaff today though went to the beautiful MONOMOY GIRL. WONDER GADOT made her way to the front and set the pace shadowed by MONOMOY GIRL. In the end, it was MONOMOY GIRL coming home with two and a half lengths in a hand ride followed by WOW CAT and MIDNIGHT BISOU. 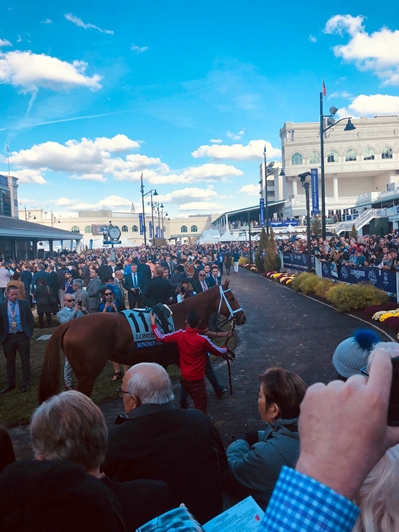 ENABLE was just ready to go for the 1 1/2 mile turf. She looked great in the paddock and had a spark in the post parade. MAGICAL was another that we had our eye on and was a wildcard on our tipsheet. This was a fantastic turf race with ENABLE dominating. After the break GLORIOUS EMPIRE and CHANNEL MAKER set the pace. ENABLE found a little traffic early. In the first stretch run, SADLER'S JOY was dead last. 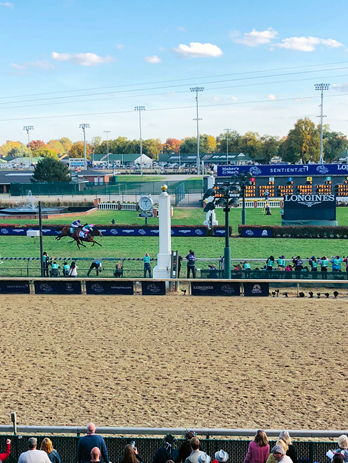 In the last turn, ENABLE went four wide and made her move down the stretch with MAGICAL right along with her. SADLER'S JOY found his way to third, but ENABLE and MAGICAL were several lengths ahead in an exciting finish. Finally, it was the race everyone had been waiting for. A field 14 of the best horses in the country and arguably the world. From the start, MENDELSSOHN went straight to the front and set the pace. 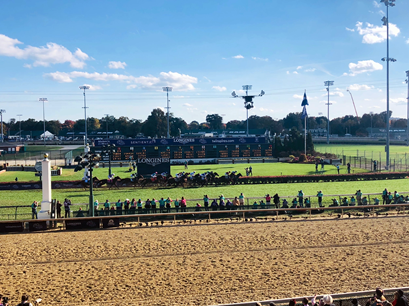 At the top of the stretch, MENDELSSOHN tried to hold on, but THUNDER SNOW, ACCELERATE and GUNNEVERA were all there trying for the win. In the end ACCELERATE went to the wire first followed by GUNNEVERA and THUNDER SNOW. YOSHIDA also put in a strong bid down the stretch, but was held off. It was honestly the perfect ending to a great day of racing. Churchill obviously knows what they're doing when it comes to crowds. They had reported a crowd of 42,000 on Friday and Saturday had to be larger, but you'd honestly never even know it. 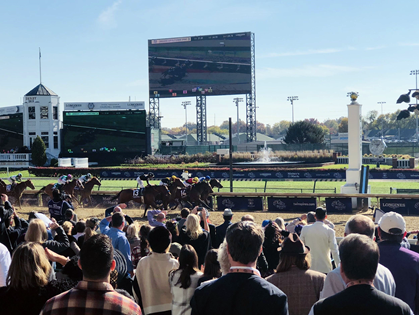 Start planning your future Breeders' Cup trip today!